Gulf Breeze, FL – The Andrews Research & Education Foundation (AREF) is continuing to expanding their education platform to include online courses for continuing education units (CEUs). The course materials will consist of lectures, presentations, and video content that will provide subscribers with full access to the accumulative knowledge of our world renowned physicians and orthopaedic sports medicine healthcare providers. Combining invaluable information with an online education program, AREF will now be able to offer medical personnel a convenient alternative to gain access to higher learning education. Gulf Breeze, FL – Brandon Winchester, MD is a renowned anesthesiologist known for his expertise in the field of ultrasound guided nerve blocks for orthopedic surgery. As an investigator for the Andrews Research & Education Foundation (AREF), Dr. Winchester was approached by Halyard Health to lead an investigation that would provide real time ultrasound imaging video capture for the development of a regional localization data system. As a result of his proficiency and dedication to research, it was announced by Halyard Health that Dr. Winchester would be recognized for his achievement of being one of the top enrolling investigators for this multicenter research trial. "When participating in research with the Andrews Research & Education Foundation, anesthesiologists like myself have the unique opportunity to provide safe and efficient clinical care to patients every day while also participating in local and national multi-center studies aimed to advance our specialty and improve international patient care. 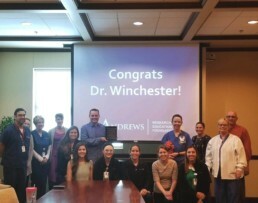 Balancing advanced clinical practice with cutting edge research is something traditionally reserved for tertiary care academic centers, and is one of the things that makes the Andrews Foundation such a special place to work,” said Dr. Winchester. Dr. Winchester has collaborated with AREF on a variety of research studies involving the use of ultrasound guided nerve blocks to further develop better outcomes for patients undergoing orthopedic surgery. This new research will allow Halyard Health to develop a database of videos capturing the most commonly used ultrasound guided nerve blocks. The end goal of this exciting study is to have the capabilities to share knowledge from nerve block experts such as Dr. Winchester on a national scale with other practicing anesthesiologist, thus furthering education from research and quality of life for patients.